Comments: Carey (Nee: ) | Jefferson OH United States | 1851-1900 | Comments: saw on online auction with following description: This is a cabinet card photo of 12 young ladies. Some are holding fans (open and partially open). 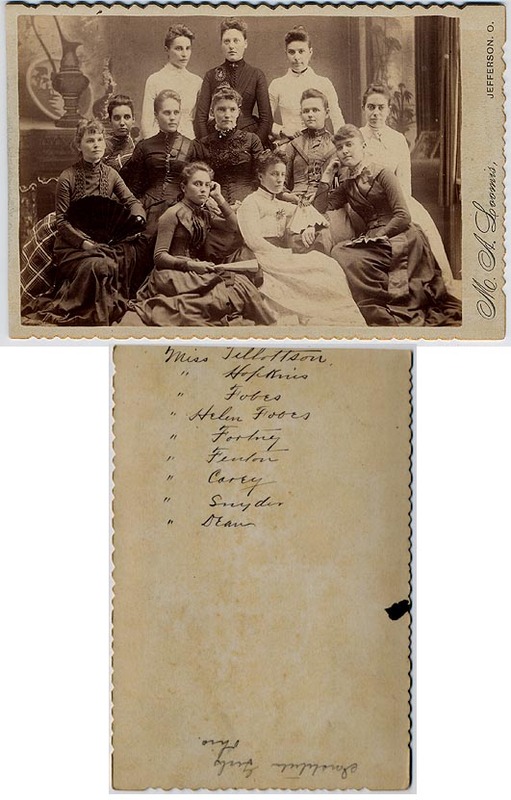 The names of nine of the young ladies in the picture are noted on the back: Miss Tillottson, Miss Hopkins, Miss Fobes, Miss Helen Fobes, Miss Fortney, Miss Fenton, Miss Carey, Miss Snyder, and Miss Dean. Photo was taken by Loomis in Jefferson, Ohio, ca. 1886-87.